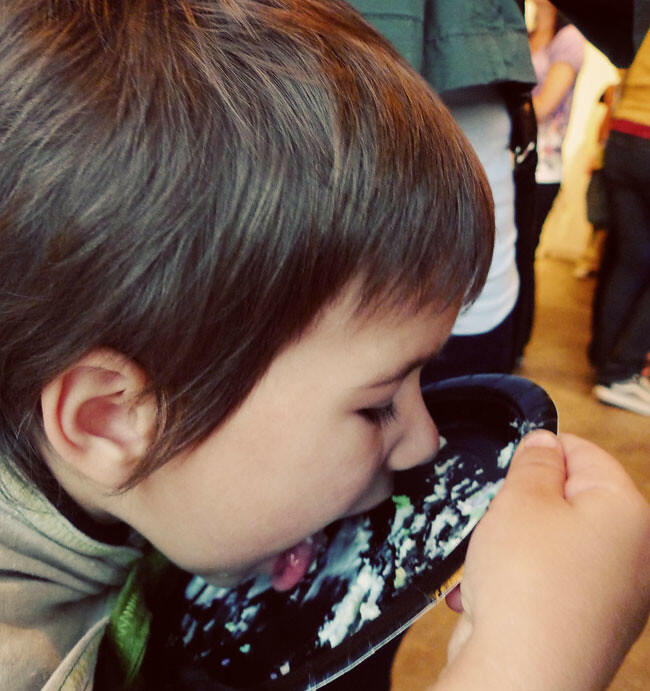 Apparently it was plate-lickin' good. The recipe I used was for a pound cake. This worked well because it's a dense and heavy cake, able to support such gigantic proportions. If you have a recipe you'd rather use, go for it, you can still follow my basic proceedure. In a small bowl, combine sour cream and baking soda, mix well and set aside. In a large bowl, cream butter, sugar and vanilla. Beat in sour cream mixture. Add 2 eggs alternately with 1 c. flour, repeat 2 more times. If desired, tint with food coloring. Pour into a greased and floured pan, with the bottom lined with parchment paper. Bake at 325 degrees. Baking times will vary based on the pan you are using. I made my layers in cookie sheet / jelly roll pans, and they took about 25 minutes to test done. Deeper pans may take up to an hour, but the cake is done when you insert a toothpick and it comes out clean. 1. I used Wilton gel food coloring to tint my batter. I made 6 layers, so 6 batches, and 6 different colors. Make as many batches of cake as necessary to complete the size cake you desire. 2. Make sure you grease and flour well, and don't forget the parchment paper. Once the cake comes out of the oven let it cool for about 10-15 minutes. Run a knife along the edge to loosen. Lay a sheet of wax paper over the cake top, then gently flip over. I flipped mine out onto vinyl placemats, it was the only thing I had that was large enough. If the cake is sticking a little, tap on the pan, and try prying a knife at the corners. Let cool completely. 3. Once all your layers have been baked and cooled, it's time to prep the layers. First, trim all the edges so you have a nice crisp edge. 4. 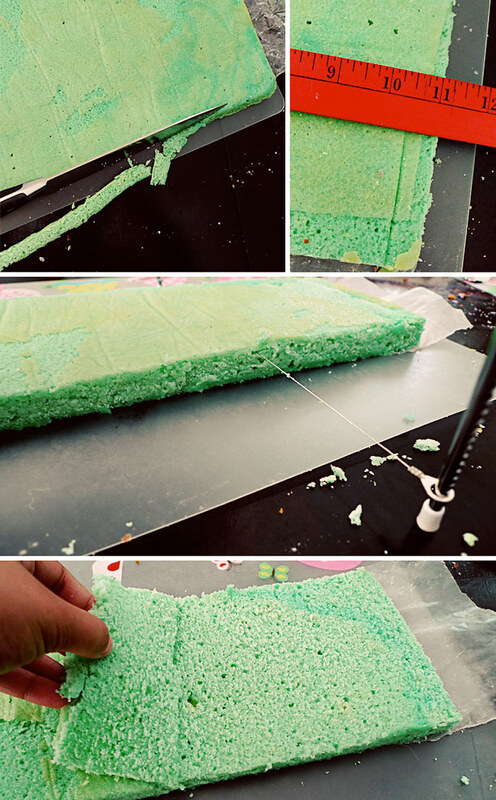 If you're making a long rectangle cake like me, you'll need to trim the layers down to size. 1 jelly roll pan makes 2 long rectangle sections, so 2 cake blocks. I made the layers using 3 different pans, so I had to trim them all to a standard size. For me, that was 5.25" x 18". Use that wax paper under the cake to carefully separate and transfer the layers (give it a good run with a knife, and it will tear perfectly to separate). 5. You must level the layers. If you skip this step, your cake will be slanted and lack good even edges. 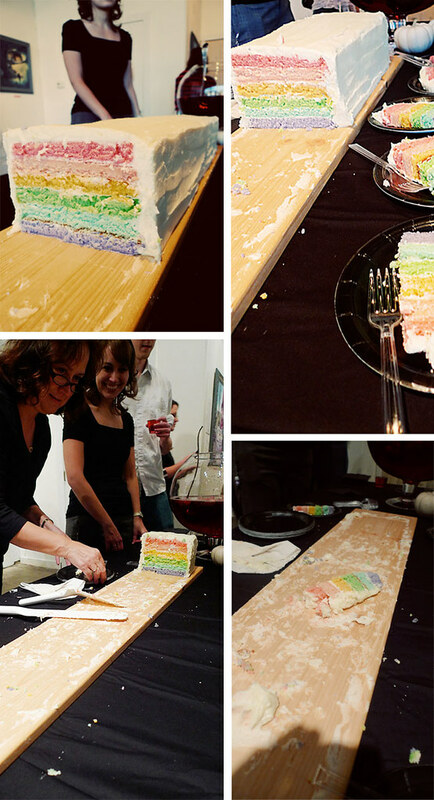 Using a gentle slicing motion, slide the leveler through the cake at a height that will work for all the layers. If you don't want to spend $2 on a cake leveler, you can use a serrated knife, I'm just not able to get it perfectly even that way. Once you've sliced through the top of the layer, just fold back the cut portion and remove. 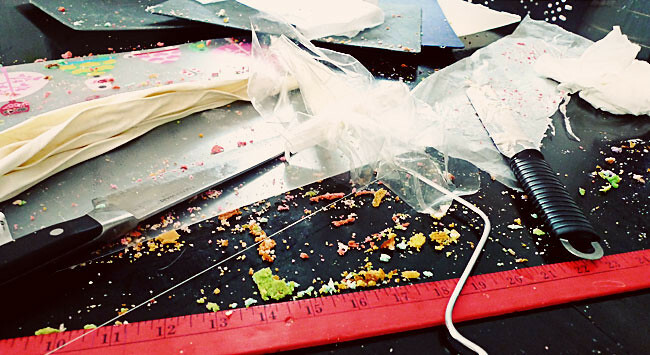 Warning: By this point, there will be cake crumbs everywhere. You'll just have to deal with, it's going to get worse before it gets better. 6. Once you've prepped all the layers, you can begin assembling. You'll need plenty of frosting, I used 2 batches of Best Buttercream. Begin by setting your first layer down on a large flat surface, for me, a placemat. 7. Spread a thin layer of frosting on top of the cake. I didn't want thick layers of frosting in between all the layers, so this thin layer just acts as glue, holding the next layer in place. 8. Carefully set the next layer on top. I found the best method to transfer the unwieldy pieces was to stand it on on it's side, then flip onto the top. If you can any cracks, do not fear. There's enough cake surrounding it to hold it together. I even had one break in half, but it held together fine with a little frosting. Continue with the thin layers of frosting and cake layers until you are done. 9. Now that you're all stacked, it's time to crumb-coat. 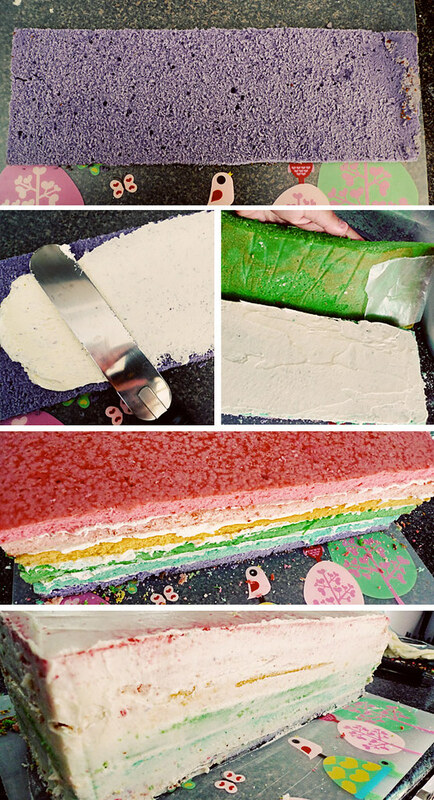 Apply a thin layer of frosting all over the exposed surfaces of the cake. This seals in the cake and the crumbs so that you can apply the final frosting with ease. 10. If you're making a long rectangle cake like me, you have to repeat the layering and frosting process for your second cake block. Once everything is done and crumbcoated, stick it in the freezer for 2 hours. This will set the frosting and firm up the cake layers so you can handle and/or transport it. 11. Place the cake on your desired serving platter. For the long cake I made, I used piece of untreated pine, cut to 1"x 6" x 42", sanded, and sealed with butcher block wax. I placed my 2 cake blocks end to end on the board to form one continuous cake. 12. Frost away! 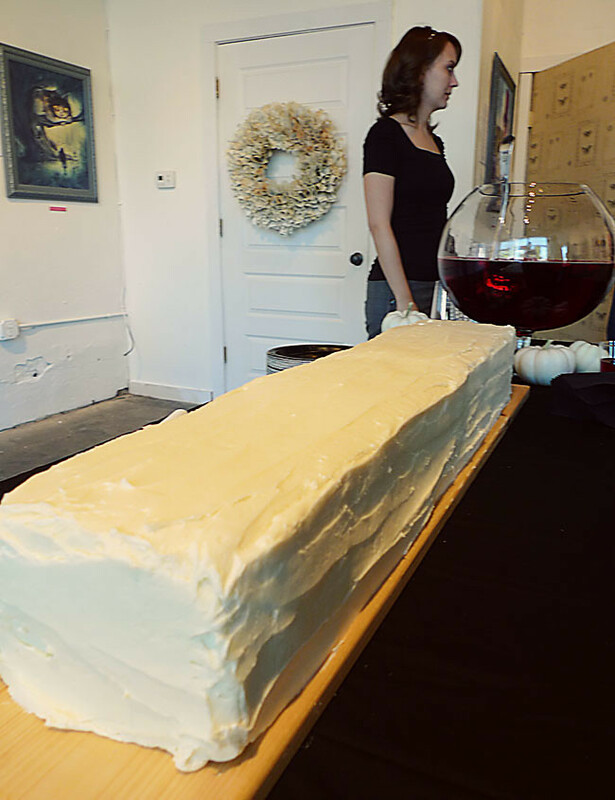 My long cake took about 6 batches of Best Buttercream. This cake is amazing...thanks for including your recipe and process! 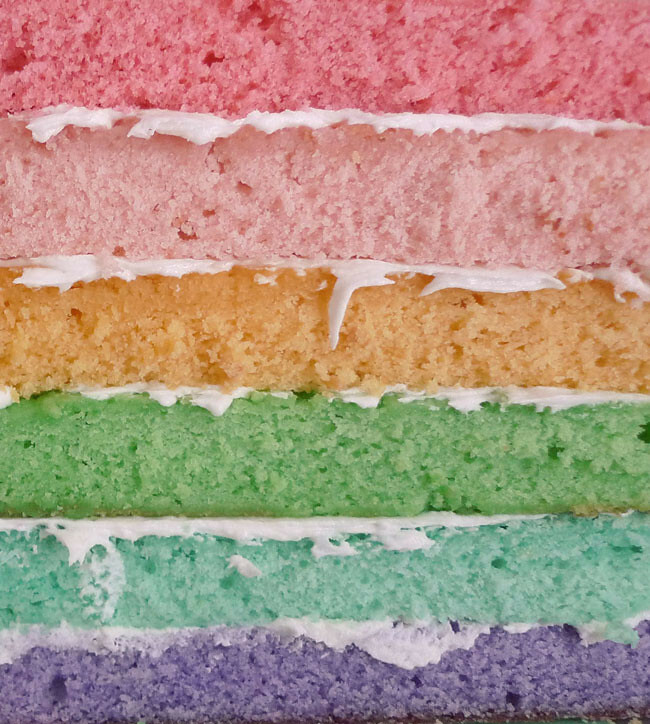 Hi Erin, Today I made a rainbow cake following your directions. I saw your post back when it was new, and have been waiting for an occasion worthy of the time it would take to make the cake. Such an occasion presented itself AND I had time to work on cake construction today. I love the results, and am sure it will be a big hit at my gathering. Thanks for the directions! they’re able to avail anything from 1,000 to 25,000.